Remember when agreements used to be consummated with a handshake and a pen? Remember when you sat in a pricey downtown Boston restaurant and actually met the person with whom you were doing business? Face-to-face interaction is quickly becoming obsolete. The Internet has changed the way the world does business. Whether placing a bid on eBay®, buying books on Amazon.com®, or clicking on the “I accept” button on a website agreement, the Internet has changed the way many people and companies transact business with each other. How Do On-Line Contracts Affect My Company? If your company does any business in cyberspace, you need to have thorough and well-drafted contracts. This isn’t as simple as it sounds. Traditional contractual concepts of offer, acceptance, and consideration can take on new meaning in cyberspace. 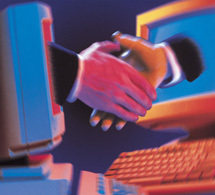 Agreements that may be binding in the real world may be unenforceable on the Internet. When does clicking “I agree” actually bind the user to the terms of your agreement? Issues such as “assent” have been heavily litigated in this context. When are revisions to the agreement binding on the customer? Are there any terms in your contracts that violate existing law or other public policy issues? Can the use of automated processes impact the enforceability of the agreement? Can jurisdiction be a problem if one of the parties is located outside of Massachusetts? These are just a few of the many areas of on-line contracting you must address at the outset. What Types of Contracts are On-Line? Software escrow, to name a few. There are now several state and federal laws that apply to on-line contracts. Laws such as the Electronic Signature in Global and National Commerce Act (E-SIGN), the Uniform Electronic Transactions Act (UETA), the Uniform Computer Information Transactions Act (UCITA) and others can have a dramatic impact on the types of agreements that your company needs. We can help your company draft contracts and licenses that are tailored to your company’s needs and binding upon the other party, whether they’re located in Massachusetts or not. We know the trouble spots that can arise when drafting these agreements. We will guide you through many of the potential pitfalls associated with transacting business on-line so that your business is protected. We can review your existing agreements and determine if your company is obtaining the maximum benefit from its contracts. In addition to on-line contracts, we can draft and review a wide range of other contracts and agreements for your business. Contact us for additional information about what we can do for your company.